Thank you for all of the words of encouragement regarding our big move! Probably the hardest part of this process so far has been telling people of our plans to move, and hoping that we can explain our thinking and show that while the path we’re choosing is unusual, it’s also intentional. We want to make sure we’re living the lives we want to live, and that we are questioning our decisions to make sure that the opportunities we pursue are the ones that will bring us closer to goals. Moving to Al Ain ticks those boxes for us, even if it offers unique challenges at the same time. Obviously, we decided yes. Our thinking at the time was “when will we ever have the option to go to Abu Dhabi again?” Hahahahahahaha. See? We really had no idea that just six short months later we’d be planning to move there! Anyways, once the decision was made, we put plans in place for Matteo to stay with his grandparents for the week, and we started to research the UAE. In the midst of planning for this trip, we obviously also found out that we’ll be living there. Tony signed his work contract about a month before we traveled there on vacation, so it was fun to plan and enjoy the trip knowing that this place we were visiting will be our home in a few months’ time. So, on to the actual trip. This was my first major international trip. I’m not the best flier – I’m far better than I used to be but take-off and landing still gets me nervous. The flight over, while long, was smooth and comfortable. The worst part was trying to mentally navigate the time change – we essentially lost a day on the way over. We left Dallas and 15 hours later we landed in Abu Dhabi. Once we were through customs, we found our way out of the airport and off to the pickup spot for the Etihad bus that would take us from Abu Dhabi to Dubai, and then once in Duabi we took a taxi to our hotel. It was a long, long, long day of travel. We stayed downtown, at the Radisson Blu and had a great view of the Burj Khalifa from our room. A few months prior to our trip, Tony had emailed the hotel’s concierge and was able to weasel his way in to a room upgrade – to the nicest suite in the hotel. So we were very spoiled with a gorgeous room. 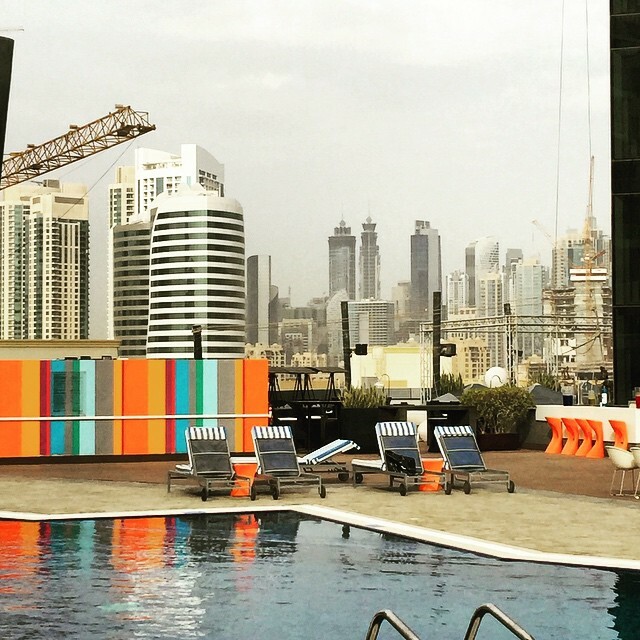 First impressions of Dubai were – opulence. If you’re a fan of architecture, put this city on your travel bucket list. We could have spent all of our time in Dubai simply looking at the beautiful buildings. Based on the amount of construction currently going on in Dubai, I know that even just 5 years from now the city is going to be far different from what it is today. It’s also a very clean city. I don’t think we saw any litter anywhere, and even public rest rooms were very clean. 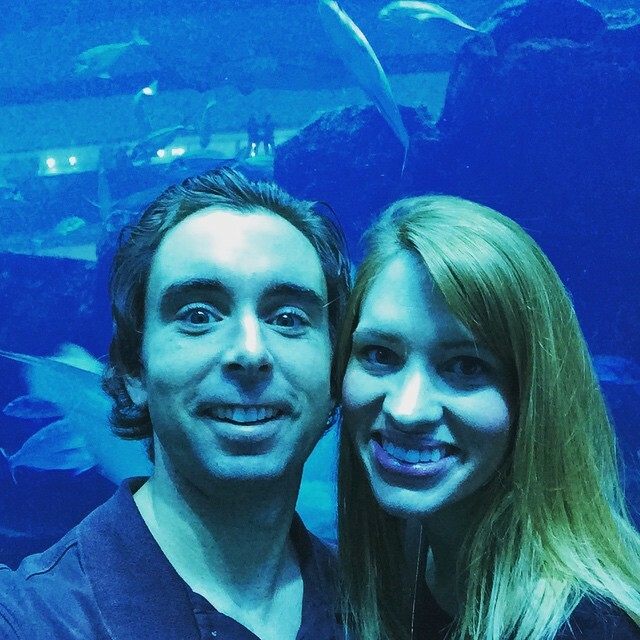 Dubai is famous for its insanely large malls, so we spent some time just wandering the Dubai Mall – we went to the aquarium, checked out the ice rink, and just walked the massive wings/floors. Everything was there – from American Eagle and Gap to Versace and Gucci. Emirates also do there grocery shopping in the malls, so we were able to check out the cost of groceries for future reference. 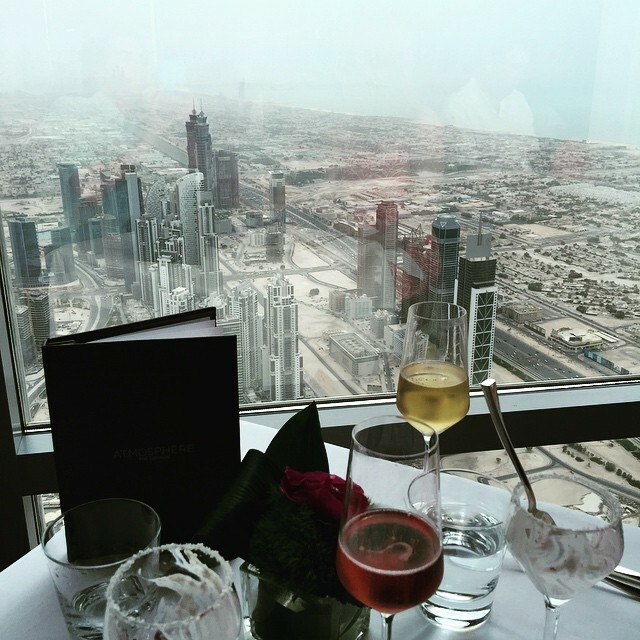 The highlight of Dubai was our high tea service at the At.mosphere restaurant of the Burj Khalifa. We’d been anxiously looking forward to this vacation splurge and it did not disappoint. The views from the Burj Khalifa are almost dizzying – even on the somewhat hazy day, we could see so much of the development and architecture that has put this city on the map. The food? Amazing! And we were even treated to Dubai “mocktails” that were to die for. Without a doubt, this was our favorite part of our time in Dubai. A few days in Dubai felt like enough though. It really is a city of excess, and at some point it just felt like too much. We were ready to leave and head to Abu Dhabi. In an effort to try something different, we decided to take the bus to Abu Dhabi – which was a fun experience in and of itself. A very clean bus with wifi service surprised us. 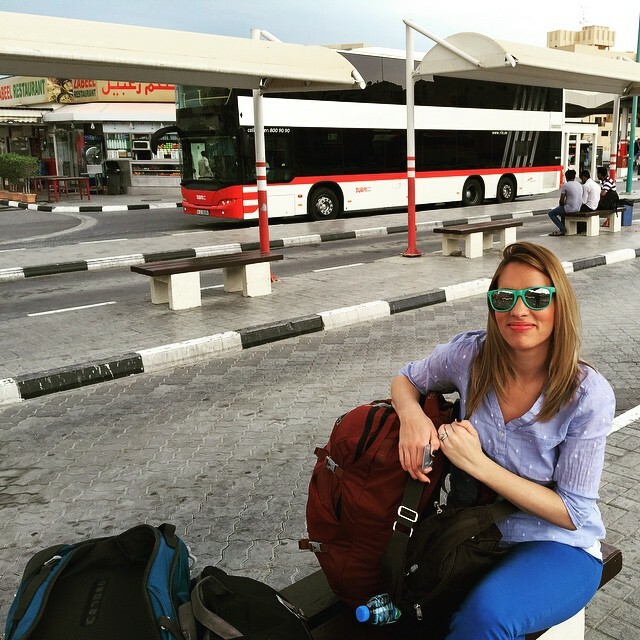 From the bus stop in Abu Dhabi, we took a taxi to our hotel – the Ritz Carlton. Can I just say, thank goodness for points? We were able to stay on this beautiful property where every detail was thought out and luxurious. You know how I just said that Dubai felt like too much excess? Abu Dhabi, even the Ritz Carlton at Abu Dhabi, had a different feel. It felt more like a big city, but one that wasn’t trying to prove its worth to everyone. Exploring Abu Dhabi reminded me of exploring New York City, back when I was 16. With different pockets to the city – an artists’ district, a financial district, religious sites, etc. Tony and I agreed – without really being able to put our fingers on why, we just liked Abu Dhabi better. I’m sure the hotel had something to do with it. 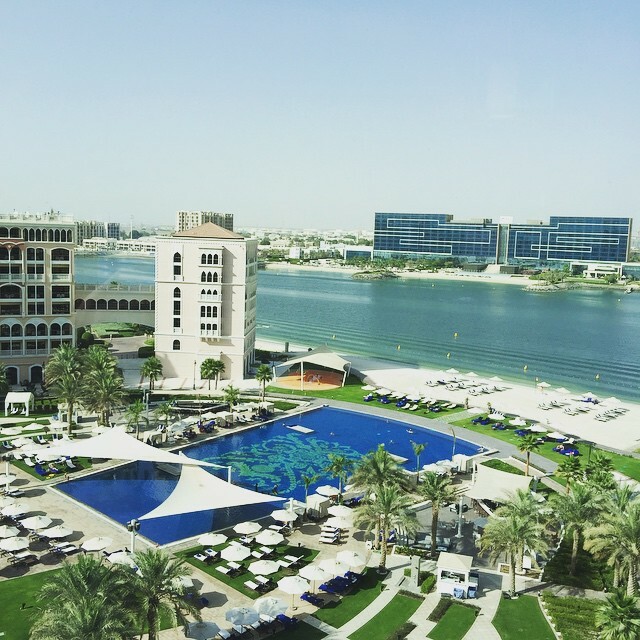 The Ritz Carlton Grand Canal in Abu Dhabi is magnificent. The rooms? Beautiful. The service? Impeccable. Hospitality as it should be. We enjoyed everything about our stay, including the knowledgeable employee we met named Rakesh — he greeted us by name each day and made suggestions to help us make the most of our sight seeing. 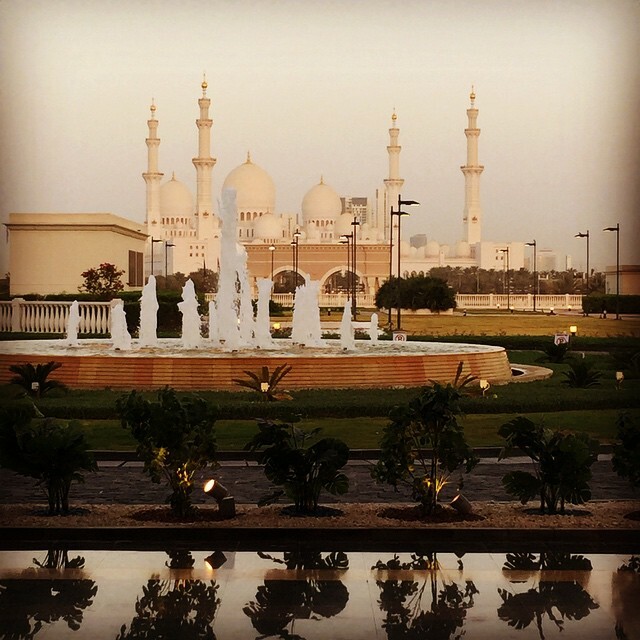 In Abu Dhabi, the highlight was our visit to the Grand Mosque, conveniently located just across the way from our hotel. This beautiful holy site is absolutely stunning in person – white marble everywhere, with crystal flowers inside, and the largest carpet in the world. There were many tourists on the site taking in the beautiful architecture, and Tony and I were far from alone in our stunned silence at the beauty of the structure. Its hard to explain – its just awe inspiring. The feel of the UAE was comfortable. I know the worries people have when we say that we’re moving to Al Ain – we say “United Arab Emirates” and people hear “Middle East.” I understand why that’s scary, but its important to understand that the characterization that most people have of the Middle East is not accurate when we’re talking about the UAE. Neither Tony nor I ever felt unsafe or in harm’s way, even when we ventured away from the tourist areas. We felt welcome and we felt excited – excited to know that this beautiful country, with its blue sea and white sands, its palm trees and rolling sand dunes, will serve as our home for two short years. It was an amazing trip. But man, oh man, were we happy to see our little boy when we made it home! Major thanks to Carl & Kathy, and Brian & Angie for taking care of Matteo while we were away!